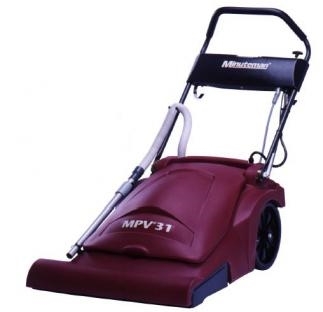 The Minuteman MPV 31 Wide Area Carpet Vacuum lets you get the job done quickly and efficiently. This system has a 30 inch cleaning path that cleans up to 25,000 square feet per hour. On-board accessory tools provide easy cleaning of above the floor and hard to reach areas. Vacuum features convenient foot lever for multiple brush height adjustments, and multiple handle adjustments to fit operator height. This wide area vacuum is lightweight and low-profile for ergonomic operation, and its Clean Air Filtration System keeps the air clean during use. Folding handle makes allows for compact storing. Includes one Disposable paper debris bag (270183) and on-board accessory tools: dust brush, crevice tool and combination hard/floor carpet tool.